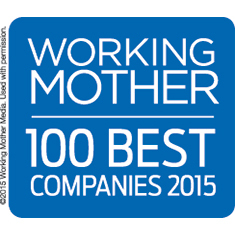 (CHICAGO) Katten Muchin Rosenman LLP announced today that for the ninth consecutive year the firm has been named as one of the "2015 Working Mother 100 Best Companies" by Working Mother magazine for its commitment to progressive workplace programs, including advancement of women, flexibility, child care and paid parental leave. Katten partner Stacey McKee Knight, who co-heads the firm's national Litigation and Dispute Resolution practice, was also named Katten's Working Mother of the Year for her leadership within the firm and in the industry. "Katten has a long history of developing and implementing innovative workplace policies that help recruit, retain and promote women at all levels," said Katten Chairman Vincent A.F. Sergi. "Being at the forefront of these initiatives is very important because women are a vital part of our leadership and success at Katten." Katten was one of only four law firms recognized on the list and was specifically acknowledged for its dedication toward "advancement of women" by identifying female attorneys who are candidates for leadership positions and providing them with "formal business development and leadership coaching." The magazine also highlighted Katten's Women's Leadership Forum (WLF), which recently began hosting monthly lunches to bring together new and experienced mothers. "At Katten, many people are part of the conversation when it comes to fostering the advancement and leadership of women within the firm and in the legal industry," said Knight, mother of two and a founding member of Katten's WLF. "This recognition underscores the firm's entrepreneurial spirit and flexibility. It also shows that it's possible to make sound business decisions that allow employees to realize their personal and professional goals." Katten has established innovative leave and flexibility policies. In 2014, the firm increased primary caregiver paid leave to 14 weeks and non-primary caregiver leave to four weeks for both childbirth and adoption. Employees can also use a combination of flex-time, reduced hours, telecommuting and annualized hours to customize the schedule that best fits their needs. In addition, the firm offers programs that provide support, networking and business development opportunities geared toward attorneys looking for support as they continue on the path to partnership. "As we celebrate the 30th anniversary of Working Mother's '100 Best Companies,' we are keen to recognize leaders who have built initiatives that truly support all employees," said Subha Barry, vice president and general manager of Working Mother Media. "They are the vanguard of successful companies, with policies that matter to American families." To compile its annual list, Working Mother assesses companies on aspects such as workforce representation, child care, flexibility programs and leave policies. Katten also was named to the list of "50 Best Law Firms for Women" by Working Mother and Flex-Time Lawyers for the eighth consecutive time earlier this year.